It’s no secret taking your car in for routine maintenance is key to keeping your ride running its best. But whether you’re a DIYer or green to car maintenance, these are the hacks that can keep your car running — and looking — like new. Just like an oil change, rotating the tires on your vehicle every 5,000 to 8,000 miles should be part of your maintenance checklist. Routine tire rotation can optimize your car’s handling and safety, thereby keeping your car stable, handling predictable and safe over the lifespan of your tires. Regular tire maintenance upkeep, including rotations, can extend your tire life by thousands of miles. Conversely, it can be cut in half if rotation maintenance is ignored. While rotating your tires can be done without the assistance of a professional, the $20 to $40 cost for the service is ultimately worth it. Plus, professionals have a trained eye for this sort of stuff, and they can quickly spot other potential tire issues that may need addressing. While it may seem like a luxury, having your car regularly detailed is just as important as any other other upkeep. Detailing provides a cleaning and reconditioning of the inside of your car and its exterior. Not only does a thorough detailing preserve your investment, it also protects your ride against the elements, too. To do it the right way, apply a coat of wax to your car’s exterior painted surfaces twice annually. This protects the finish from oxidation and contaminants. A high-quality detailing can take up to a few hours and often requires assistance from trained professionals. Do you check your oil? If not, you should make it a point to do so or bring your car to a local auto shop every 5,000 miles. While some old-school auto experts advise changing your oil every 3,000 miles or every three months, automotive advances over the years have rendered that advice practically obsolete. Even if you don’t drive your car all that much, the oil still needs to be changed, as engine oil becomes less effective as it ages, which can ultimately lead to a shorter engine life if it’s not changed regularly. Now, if you decide to go the DIY route, be sure to check your owner’s manual before purchasing the oil. The type and weight of oil vary by vehicle, and not following the recommendations in your owner’s manual can lead to poor performance or engine damage. Today’s car batteries don’t often require much maintenance; however, you should still know where it’s located and how to check it. Additionally, you’ll want to routinely check your car battery to make sure it’s not leaking and that there’s no buildup or minerals on its contacts. To do so, keep a battery-cleaning brush in your trunk. These tools only cost a couple bucks, and you can use them to keep buildup off your car’s battery. Experts say it’s also wise to keep a jump starter and an affordable battery tester in your trunk, too; after all, a quick jumpstart from a friend or passerby can save you hours waiting for roadside assistance if your battery goes kaput unexpectedly. 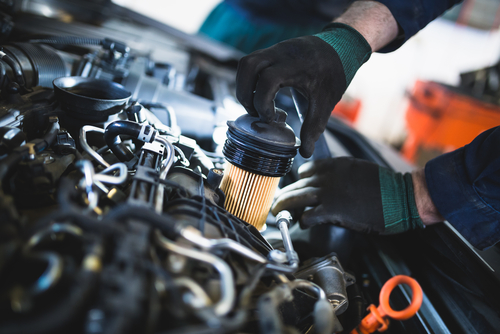 From routine tire rotations and battery checks to frequent oil changes and thorough interior and exterior detailing, making sure you invest in and regularly perform these preventive maintenance hacks can keep your car looking and running its best.